Chris-Craft’s elegant and sporty Capri 25 and Corsair 28 are a winning hand. The elegant visage of a Chris-Craft gliding across calm waters reminds one of how the Kennedys vacation, where happy children trail the boat on skis or in a tube during the afternoon and later the entire clan enjoys a sunset cruise. The following day brings another outing on the boat to a white, sandy beach, where unfurled colorful umbrellas sway and the football is tossed playfully among the family. In the background, the dark blue Chris-Craft chariot is anchored. All seems right with the world. 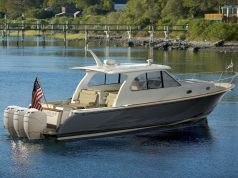 Yes, the beauty of Chris-Craft boats has never been in question, and this year’s models place an emphasis on comfort and efficiency. 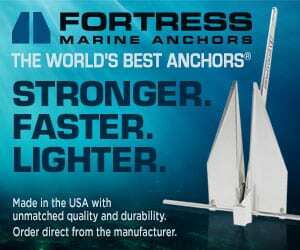 These meticulous improvements make the passenger experience better than ever while also helping the boats run farther and faster due to a lightweight stringer system. 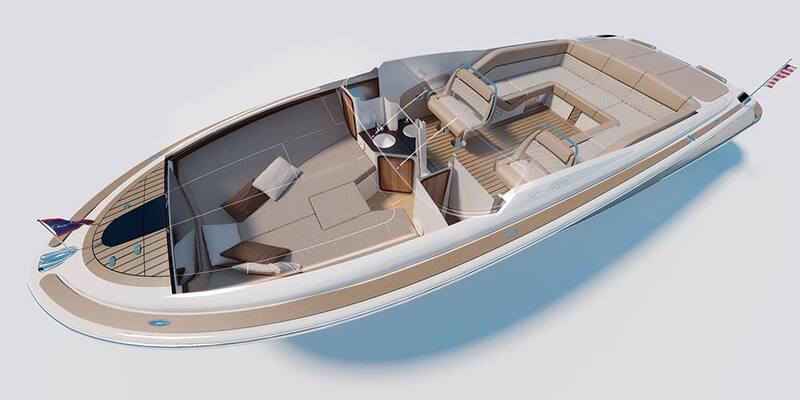 The Sarasota, Florida-based builder showed off two Chris-Craft models that exude such characteristics at the 2016 Miami International Boat Show. The all-new Capri 25 made its U.S. debut and the revamped Corsair 28 was revealed. 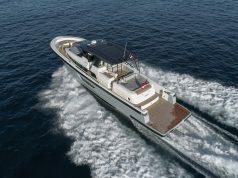 Both the Capri 25 and Corsair 28 are symbolic of the evolution of Chris-Craft under Chairman Stephen Julius and CEO Stephen Heese. 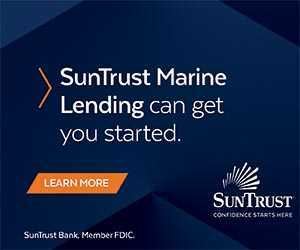 The two Harvard Business School classmates engineered the Chris-Craft resurgence in 2001 and continue to carry forward the momentum today. The Capri 25 was introduced at the 2015 Cannes Yachting Festival and is the big sister to the Capri 21, which was launched at Cannes in 2013. The Capri 25 simply offers a little bit more of everything that was great about the 21, and that’s saying a lot. 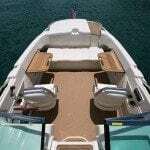 The teak walkway theme carries over to the Capri 25, but is built into the port side of the sunpad, raising and lowering hydraulically to offer a true cockpit walkway. Retreating from the teak swim platform and into the cockpit is made easier with this innovation. The cockpit offers many configurations for entertaining, as both the driver and co-pilot’s bucket seats swivel 360-degrees to face aft. There are also foldout tables in the cockpit for food preparation and serving, or you can use the counter space for card-playing and games. 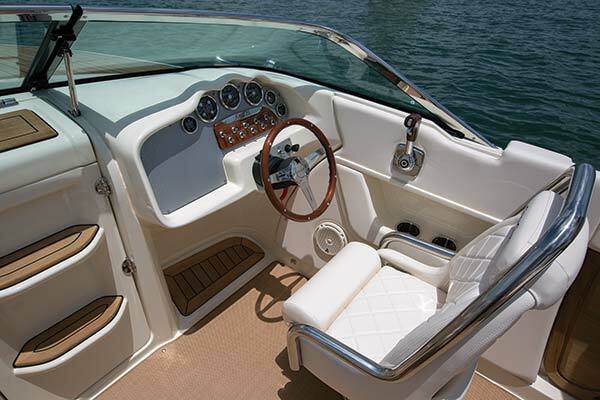 At the helm, the driver looks forward to a resplendent dash with analog gauges and throttle and shifter controls for the single MerCruiser 6.2-liter 300-hp engine. 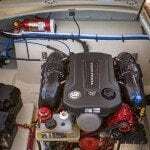 With the single powerplant and Bravo 3 drive, the Capri 25 has a top speed of 50 mph. 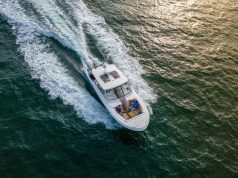 The Capri 25’s cabin offers a head and berth for extra comfort, while other amenities are a three-step boarding ladder and Fusion stereo system, which are also offered on the Corsair 28. “As one of our best sellers, revamping the Corsair 28 was the natural next step,” explains Allison Scharnow, Chris-Craft’s marketing director. 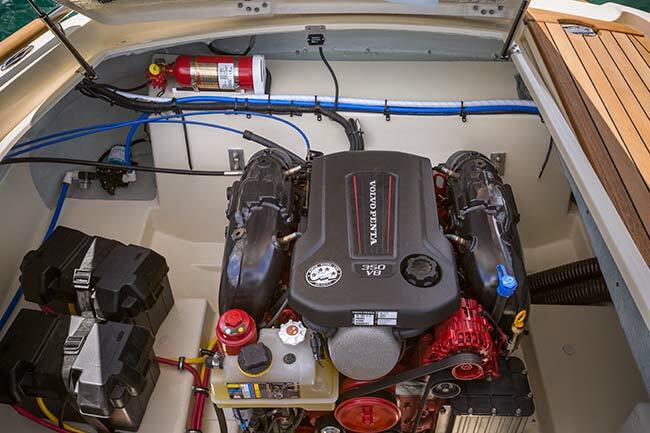 “With more luxurious touches than ever before, there is no doubt the Corsair 28 will continue to set unequalled standards for performance and design.” A huge teak swim platform off of the transom of the Corsair 28 leads to an even larger sunpad that covers the engine compartment. What’s interesting here is the design of the sunpad: it’s divided down the middle with a teak walkway into the cockpit. Fill in the walkway with a filler cushion and the sunpad stretches full beam–almost 10 feet wide. “We carefully considered the way our owners use the boat and took it a step further,” Scharnow adds. “You’ll see an example of this particularly in the cockpit with improved room at the helm to accompany the double helm seat along with a new cockpit seating configuration.” Starting at the driver’s console, Chris-Craft’s engineers added more perforated plates, chrome and teak around analog gauges, creating a jeweled look for the dash. The excellent form meets with equally impressive function as the wood steering wheel and throttle and shifter assembly are well placed for the driver, who sits in an adjustable helm seat large enough for two. The console also provides plenty of space for a large multifunction display and other electronic elements. 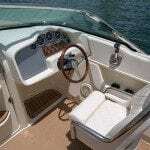 The Corsair 28’s cockpit has been refined with a U-shaped couch that offers aft-facing recliners to port and starboard. 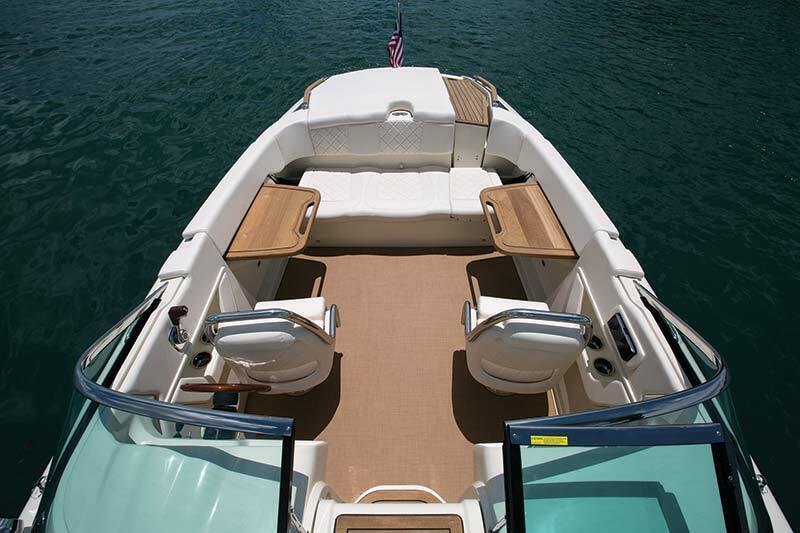 Adjust the filler cushions and your entire body is supported comfortably to watch the passing shoreline. In the cabin, natural light pours in through a large skylight in the bow, and a queen bed in the V-berth allows two adults to get a restful sleep. Also below is a head located under the bed as well as a mirror and hanging locker. Fuel Capacity: 82 U.S. gals. Previous articleProtect Our Reef grants help tackle threats to reefs.